Julia Rapson De Pauley is someone that has her style firmly established, and is now available to help us with ours. The Model Edit has long been a fan of her hand threaded vintage and contemporary glass beads. 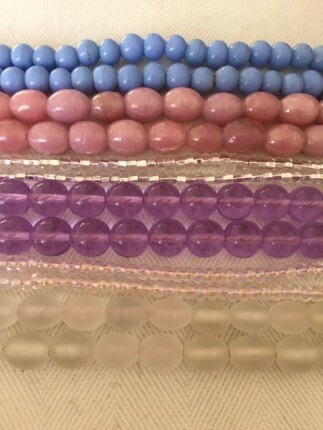 Julia sources these beads, then threads them on beautifully coordinated coloured silk thread and lays them out before us. I have many, many of these individual little ropes of art. No two strings of beads are the same, which means that you have bought not so much Pret a Porter, more Haute Couture. Julia is open to opinions on thread colour versus bead colour and length of string etc. 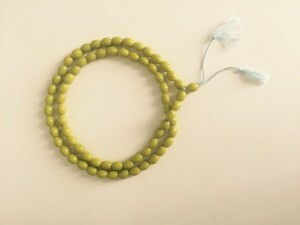 I shove a few strings of these beads on my wrists at a time because I love the weight and touch of the glass. I tend to wear bracelets rather than necklaces, and really do pile them on, because I like the vulnerability of a tiny wrist appearing from a deluge of beads, most people drape them as a necklace though. Up to you. Obviously a versatile accessory, you can be 5 years old, and you can be 50 years old and counting, which is the best kind of anything. Belts are also on the horizon as La Rapson De Pauley seeks out vintage buckles then re casts them in differing metals, which again means you are purchasing a hand made and possibly heirloom fashion statement. As I began this post I will end it by reiterating this advice; seek out accessories where you can, as they will take you from utilitarian to individuality in one easy step. are you certain the email address for Julia is correct?